as he Dad did growing up. Kaden is still kicking it with soccer and shooting around with basketball...at the same time. This week alone, we have been to practice for both sports and there is a soccer tournament plus banquet this weekend. There is absolutely no shortage of things to do around these parts. But I am tired...of driving. NOT watching my son literally grow into a young man on the field and on the court. What I love most about watching Kaden play sports is his intelligence. Sure he is athletic, but he also thinks about plays and how he can contribute to the overall good of the team. He understands the concept of "there's no 'I' in team". 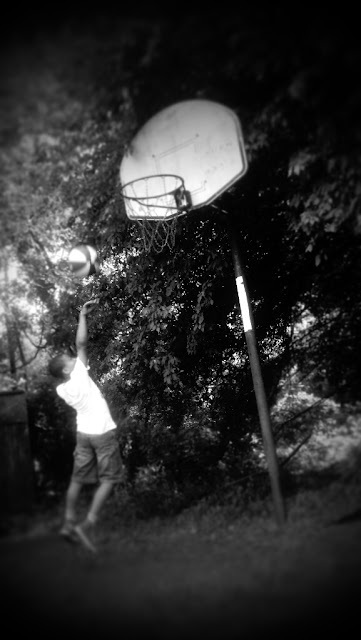 His Dad and I always encourage him to do his best, both on and off the court. Try, try and try again. Practice. Perfect. Play. His jump shot is off. He has the perfect amount of aggressive edge, team spirit and athleticism to make him a great player. I know that if Kaden decides he wants to give soccer and/or basketball a break, he will be just fine. They aren't his life, but they do make it more exciting. As I've said before, black boys can jump...doesn't mean they have to. He takes on so much as a child even when there is no need for it. We support him in all of his efforts, both big and small. That makes me, and his Dad, very proud. With basketball season underway, I can only imagine the strides he will make being almost one year older. Watching his games are a form of inspiration. I watch as each child demonstrates fearlessness against the competition. For a moment, even I think I can play sports. Ha! I'm excited to see what this season holds and what kind of player Kaden becomes.